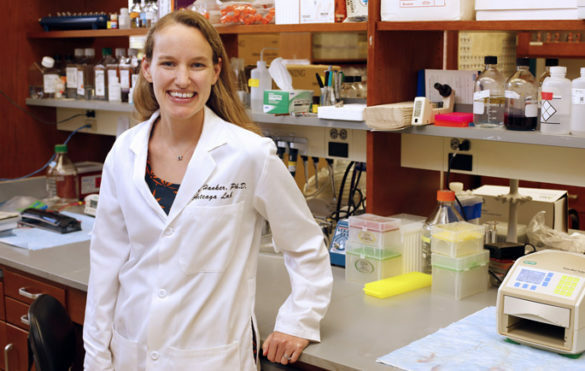 Research led by Vanderbilt-Ingram Cancer Center (VICC) investigators may have solved a mystery about why a targeted therapy stops working in a small group of breast cancer patients. They identified a novel gene mutation that develops in the tumors, and then found a different cancer drug that appears to treat the newly identified mutation. The finding may have implications for treatment of several types of cancer. The study, led by first author Ariella Hanker, Ph.D., research instructor at VICC, was published in a recent issue of Cancer Discovery. The mystery started with a 54-year-old patient whose breast cancer was labeled estrogen receptor positive (ER+), HER2 negative — a common type of cancer whose growth is fed by the hormone estrogen. Despite receiving chemotherapy and estrogen blockers her cancer continued to grow and she was referred to Carlos Arteaga, M.D., VICC’s director of the Center for Cancer Targeted Therapies (C2T2) and director of the Breast Cancer Research Program. Arteaga sent tissue from a tumor biopsy to Foundation Medicine for genomic testing and they discovered the cancer had a novel mutation in the HER2 gene. But this wasn’t the normal amplification of the gene, it was a change in the DNA sequence labeled HER2L896R. A search of gene sequencing databases found 21 other patients with the same mutation, and most had breast cancer. The patient was to be enrolled in a clinical trial of neratinib, a drug that targets HER2-mutant cancers. Her response was remarkable. But neratinib is a targeted therapy and most patients, including this one, eventually develop resistance to targeted therapy. This time the team studied the patient’s blood for circulating tumor DNA. They found the original mutation, but they also found a new secondary mutation, HER2T798I, which had not previously been seen in HER2. When the team inserted HER2T798I into cells, along with HER2L869R, the drug neratinib no longer worked. Structural modeling showed that the new T798I mutation prevented the drug from binding to the HER2 protein. “What that suggests is that the cancer really depends on the HER2 mutation for growth, and the way the cancer gets around the drug neratinib is to again mutate HER2,” Hanker said. After identifying the secondary HER2T798I mutation, the investigators needed to find a way to treat patients with that mutation. They tested existing therapies and found that afatinib, a drug approved for lung cancer, appears to be active. The patient likely will be treated with that drug when her cancer starts growing, again. Hanker said the research indicates that some tumors develop new mutations to get around specific therapies and there is a need to identify those changes and come up with new therapies for subsequent mutations. “I think targeted therapy needs to get more and more tailored. Precision medicine needs to get more precise. These variants may respond differently to various inhibitors and we need to test each one or come up with better computational models to address which mutations are going to be inhibited best by specific drugs,” Hanker said. The research was supported by funding from the National Institutes of Health and the National Cancer Institute (CA090625, CA080195, CA098131, CA68485), the American Cancer Society, and Puma Biotechnology.